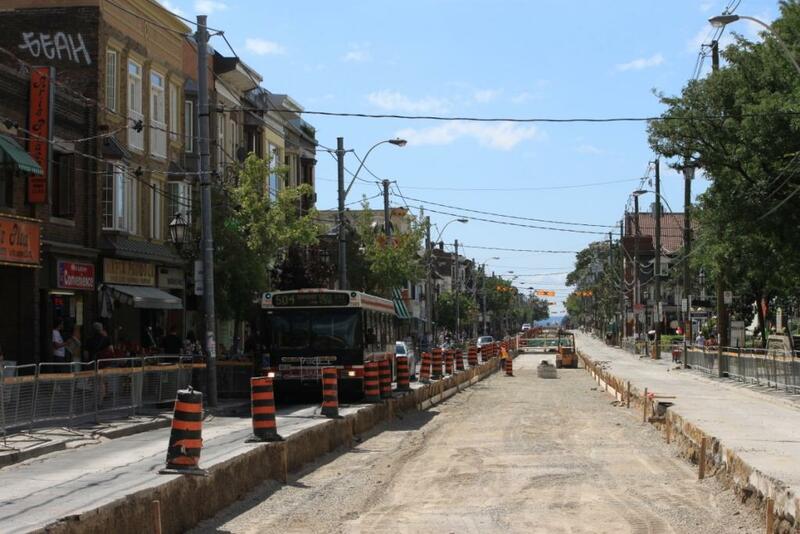 So they cut up roncesvalles to fix things/enlarge sidewalks/whatever, then they redid the street without allowing space for streetcar tracks, now they will tear up roncesvalles again for the streetcar tracks………..hmm isn’t this technically wasting? 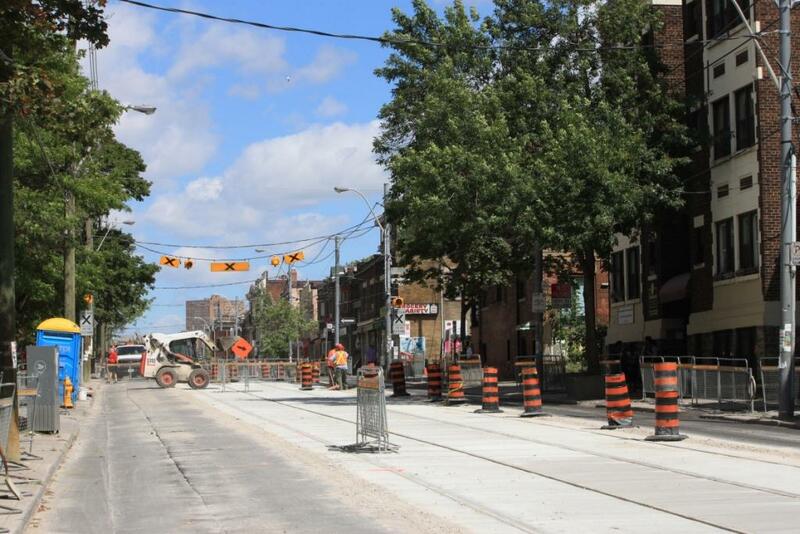 When they re-installed the street the first time they perfectly knew that there would be streetcar tracks. 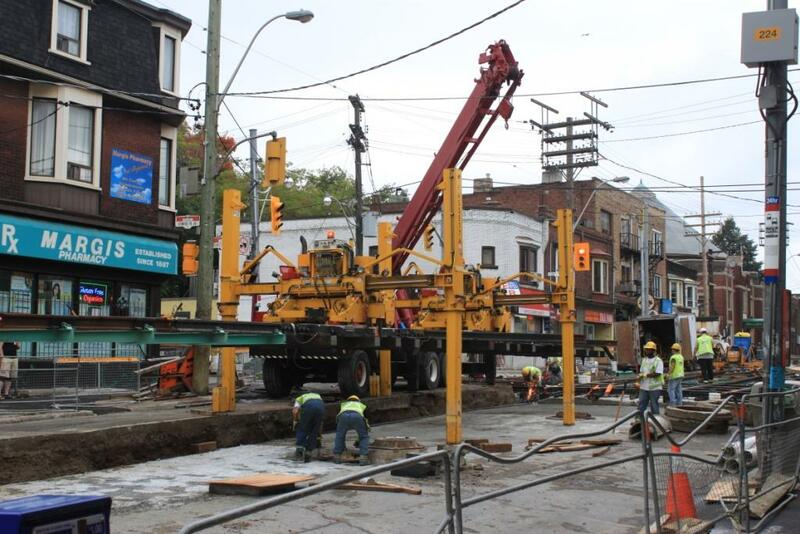 Steve: They put the street back together because of the technical drawings and contracting for the trackwork were delayed by last summer’s municipal workers strike. There has also been some co-ordination problems between the TTC and City, I understand. I will be astounded if they finish by November. The problem is that the track will be back in, but the last work to be done is the sidewalks, and the power poles cannot be installed until the sidewalks are done. Hence we will have track but no overhead. 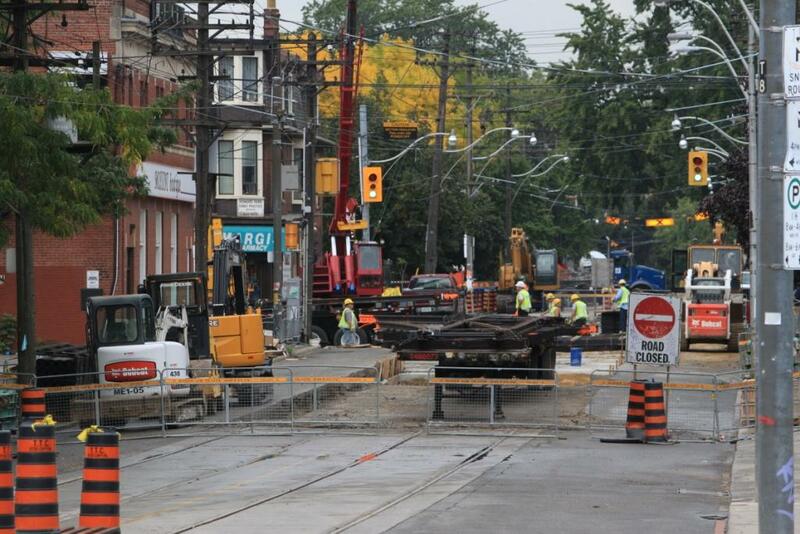 Possibly the 504 will coast downhill from Dundas to Queen, but northbound trips will be a challenge. That King shuttle bus is not very useful. 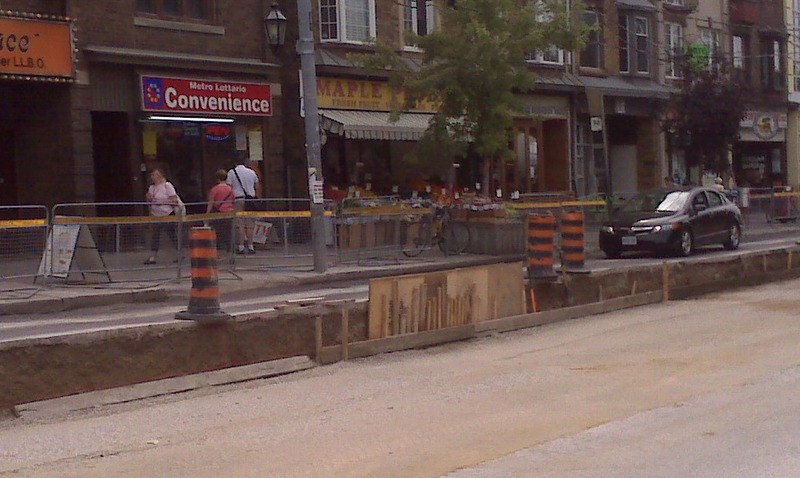 Why not just put extra service on Lansdowne Ave. between Bloor and Queen, looping close to Roncesvalles? Also, beef up service between Keele and Lake Shore along Parkside Dr. (use the U-turn east of the pedestrain bridge to turn around)? Redirect riders to the appropriate station; for the north end of Roncesvalles, there’s the Dundas car. Steve: There’s the little matter of accessibility. You cannot walk east from Ronces to Lansdowne, and Parkside is quite a hike to the west. This would be rather like my suggesting that the Queensway bus is an alternative for service on Lake Shore. 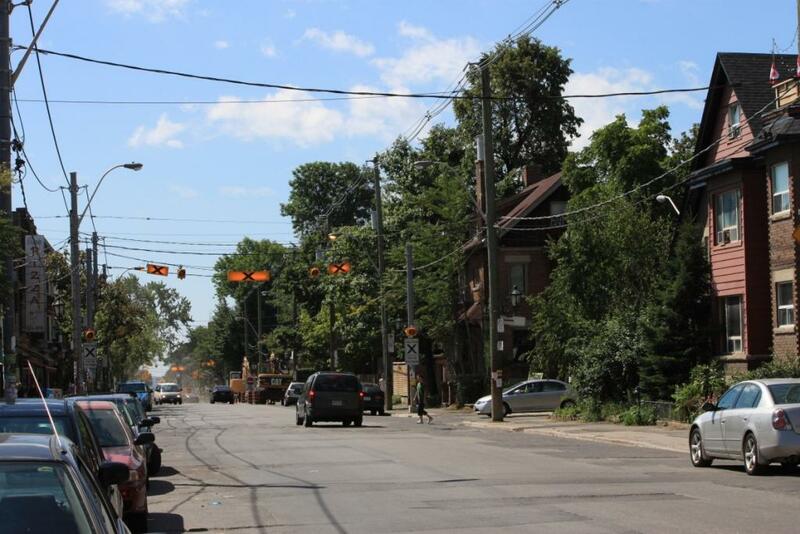 Steve: Some recycled poles that had remnants of TTC stop markings showed up in various places around the city. I remember seeing one on a hydro right of way that actually was once an interurban line. A complete, but amusing, coincidence. The King proper shuttle could continue Sunnyside–Shaw (actually Strachan). At least this routing would be useful and kept out of the Queen/Lansdowne/Jameson traffic mess. I don’t see why *anyone* would ride the shuttle for more than half its route! So no need to give a one-seat ride from one end to the other. Steve: Probably the annoying thing in the design is that when the shuttle was a loop southbound via Lansdowne and northbound via Roncesvalles, people bound for Ronces could just ride around the loop. Now they will have to change buses to pick up a northbound 504. I am sure this will confuse everyone for a few days. However, as for the one-seat ride, the portion of the King route west of Dufferin has a fair amount of traffic to and from Dundas West Station, and outbound cars (when the line was all in one piece) started picking up outbound riders once they were in Parkdale. I suppose it’s too much to expect that the possible turns from/to Parliament at King and Queen will be expanded to allow additional turning possibilities. Parliament is a useful and used short-turn and diversion route and increasing the possiblities would surely be useful. Steve: The sharp angle of turns in the northeast quadrant work against that proposal, and an earlier scheme to put Parliament Loop back in service are no more as the TTC sold the land. The next two options for a King car short turn will be either the proposed loop on Broadview north of Queenm, east side, in the existing parking lot, or Cherry Loop at Mill Street. The reason for the faded “Bus Stop” signs on Indian Road, was that there used to be a bus along Indian Road to downtown from a on street loop at Jane and Annette. Parkside Drive was a narrow Keele Street like Indian Road, and both “Keele Street” and Indian Road merged where the Queensway overpass is today. That is why there is a jog to the west for Parkside Drive as it goes north under the railway overpass. Indian Road would have forked to the east, if it wasn’t for the Queensway being built in the 1950’s. Other than issues with stop announcements and saving a few pieces of cardboard on temporary stops, is there a reason Sorauren or Sunnyside aren’t used for the southbound bus alternate? Sunnyside would be ideal, but even Sorauren is vastly more useful than Lansdowne for a Ronces diversion. Speed bumps are so common in Ottawa, it’s no problem even for 60-foot artics. C’mon TTC, don’t wimp out. As a kid, I remember an old bus stop from 59 NORTH YONGE Richmond Hill service reused as a hydro pole on a back lane behind Yonge just south of Fairlawn. Here is a TTC map from 1948 which shows the route of the High Park Extra Fare City coach route going along Indian Road. These days Indian Road has a stop sign every 20 meters making it unsuitable for as bus route. The new track ladders for Roncesvalles Division are sitting in semi-assembled form at the south end of Danforth Division yard. Good picture-taking opportunities abound. There are also at least two pairs of PCC trucks sitting over there. It appears they are used to move strands of rail and assembled track panels. There are lots of subway car trucks, too. It’s worth a visit, if the TTC police wannabes don’t pinch you. Now, wouldn’t this make a fine site for a TTC Transit Visitors and Heritage Centre? Nah. Better we should shove up to an as-yet undefined location on North Yonge, far away from any streetcar system connection. Steve comments that beefing up parallel bus service ignores the problem of accessibility to Roncesvalles. That was true when at least one direction of the shuttle ran on Roncesvalles. The new shuttle arrangement is only good for the very northern and southern ends of Roncesvalles. If you want Roncesvalles and High Park Blvd, you have a good hike; it’s considerably closer to walk in from Parkside Dr. and High Park Blvd. Correct that it’s not possible to walk from Lansdowne to Roncesvalles. 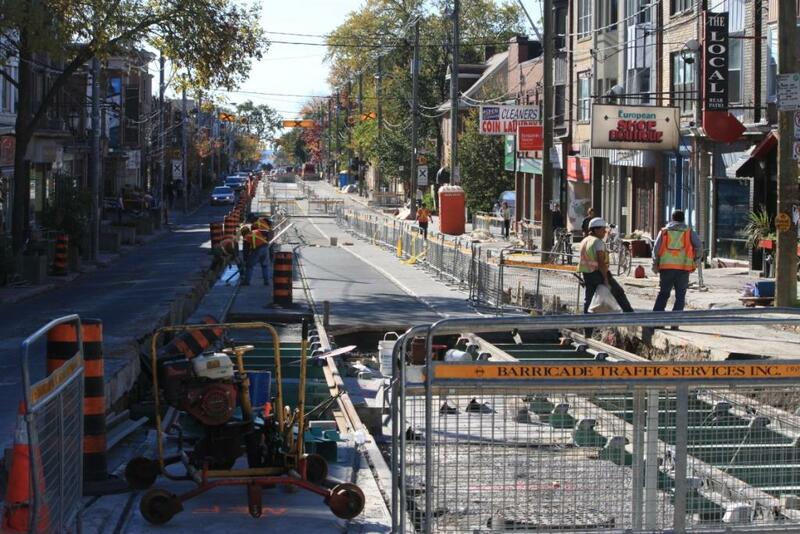 It’s too bad that running the shuttle down Parkside Dr. runs into the problem of getting over to Queen/Roncesvalles. Parkside Dr. strikes me as a much better shuttle route than Lansdowne. I was in Amsterdam last month, the trams were kept running while work was being done to sections of track. Fascinating to watch as workers stepped back every few minutes when the tram rumbled past on the 2-300m section they would work on. Isn’t what Peter is talking about what the TTC used to do? Steve: Yes. However there are two issues. First, the track reconstruction for the past decade has involved complete replacement down to the lowest slab in the road, not just the surfacve layer including the track. Second, track in Toronto is built to carry heavy truck traffic. The track in many European cities is not laid in concrete that has to cure properly for long-term strength. When comparing systems and practices, it is important to compare the fine details of operations and infrastructure. 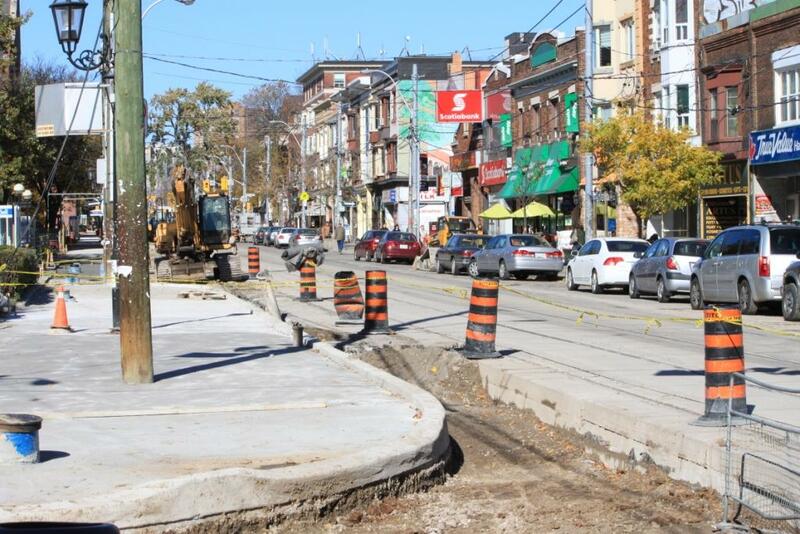 @ Miroslav Glasic: You said “So they cut up Roncesvalles to fix things/enlarge sidewalks/whatever, then they redid the street …” I think that’s an overly complementary depiction of the paving job on Ronces after the water main work. They were constantly digging holes, filling them in, and redigging them again – the road hasn’t been “redone yet”, they just slapped asphalt back on top very roughly, in case they needed to go back in – makes sense to me that they left the final repaving until the pipe work was completed. @ Karl Junkin and David Cavlovic – regarding Sorauren. They have on occasion run 504 replacements south on Sorauren and north on Sunnyside during the Taste Of Roncesvalles (or whatever they call it). I can’t speak for the Sunnyside portion, but Sorauren yes, has speed bumps, but also is fairly narrow south of Wabash, and with street parking and those buses having to go pretty slow not only for the bumps but to also avoid sideswiping cars… and remember, that street is littered with kids. I understand that at Wabash there was a bus garage many years ago – I also gather that at that time the northern end of Sorauren was more industrial, so residential concerns didn’t apply. I expect that is why Wabash itself is such a wide street. But at any rate, I fear that Landsdowne is the best bet. I live on Galley, and find – in the warmer months – that it’s more convenient to walk down from Dundas West than futz with the replacement bus. 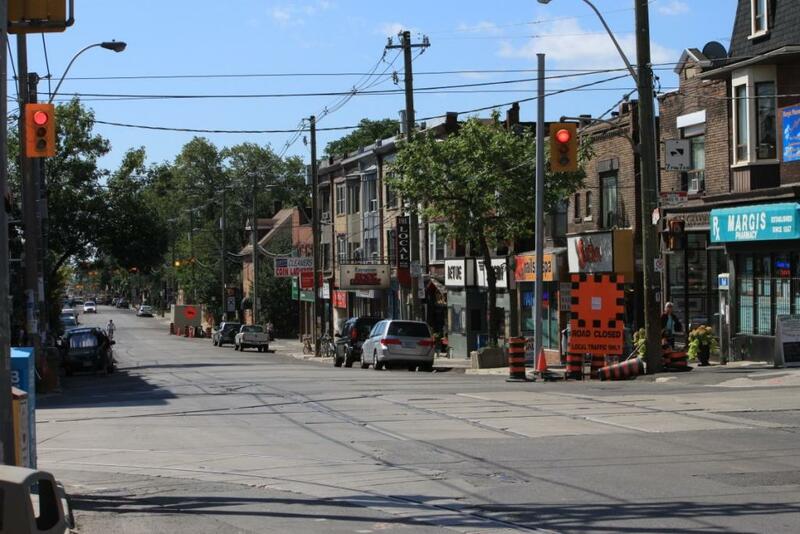 Lastly, I have heard that the track rebuild on Roncesvalles, factoring in the bump outs for passengers, will coincide with the demise of the Sunday stops, which on a street that has a church on every corner is a nuisance. 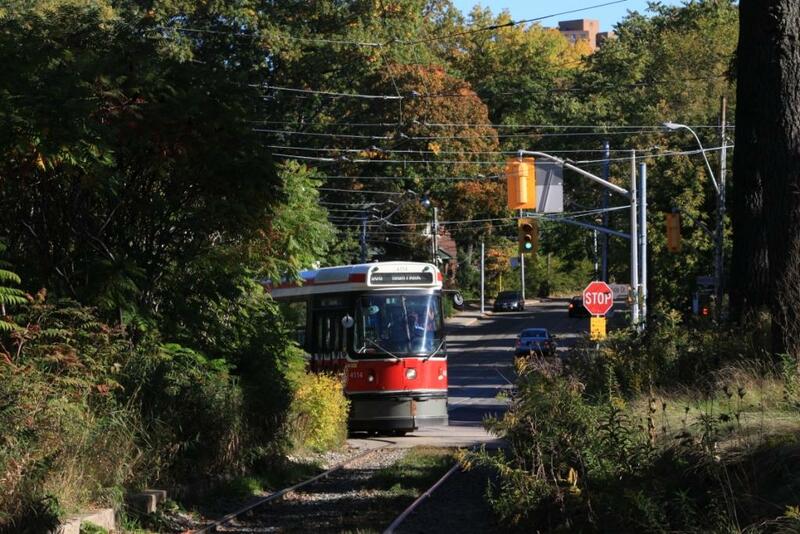 They are a generally a quaint relic from Toronto’s past, and in some cases are reasonable – but look at the southbound stops of High Park Blvd and Fern – the stops are only 1 1/2 blocks apart, and then they put a Sunday stop at Wright in between. Ugh. In 1897, Sunday streetcar service was finally introduced after approved by a second referendum. The Sunday stops was probably a result of a concession to getting the approval vote. Of course, the rich would have still had their own transportation to get to church. 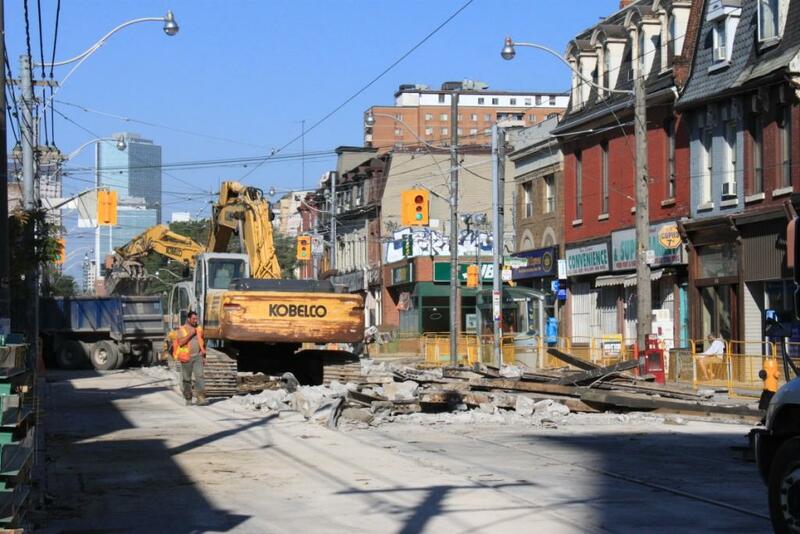 Steve: Considering that Broadview is torn up for track repairs at MountStephen Street (which, by the way, intersects Munro Street), it’s a good thing they didn’t start earlier. Sorauren is way too narrow for buses south of Wabash, sometimes two cars can hardly pass each other and it would create a danger for walkers and cyclists. Sometimes there are ways of keeping service operating. I remember when they were building the west leg of the Y under Bloor at University, they built a set of detour tracks for the Bloor trains on the sidewalks. I guess the construction time was more than 2 weeks though. Streetcars going southbound to the carhouse on Roncesvalles sometimes carried passengers. That meant 504 Roncesvalles, 505 Roncesvalles, and 506 Roncesvalles streetcars had passengers for their return trip, at least up to Queen/Queensway. With the construction, the southbound trips are nonexistent. It seems like this track work never ends. 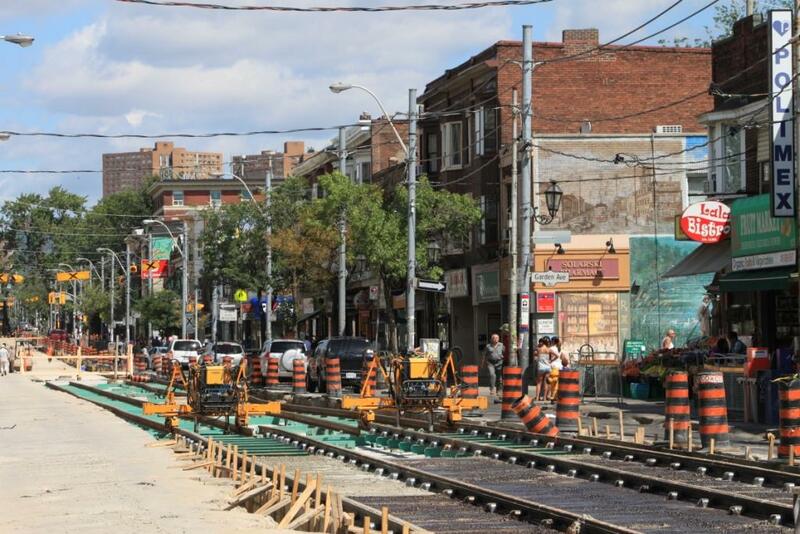 Is it true they’re going to rebuild Spadina soon, after only 13 years? I thought all this new track was supposed to last at least 25 years. Steve: Roncesvalles and the west end of King are among the last pieces of “main line” trackage that have yet to be built to new standards. The intersections (including those on Spadina) didn’t get the new treatment as soon, and that’s why the Spadina crossings are coming up for replacement. By the way, don’t forget that as intersections they had traffic on them from east-west lines from the moment they were rebuilt, and they date from 1996, the year before the 510 Spadina route opened. Still, not exactly a record to be proud of. One other big piece of “old” track is the original Harbourfront line (including Spadina south of King) that is now 20 years old and falling apart. 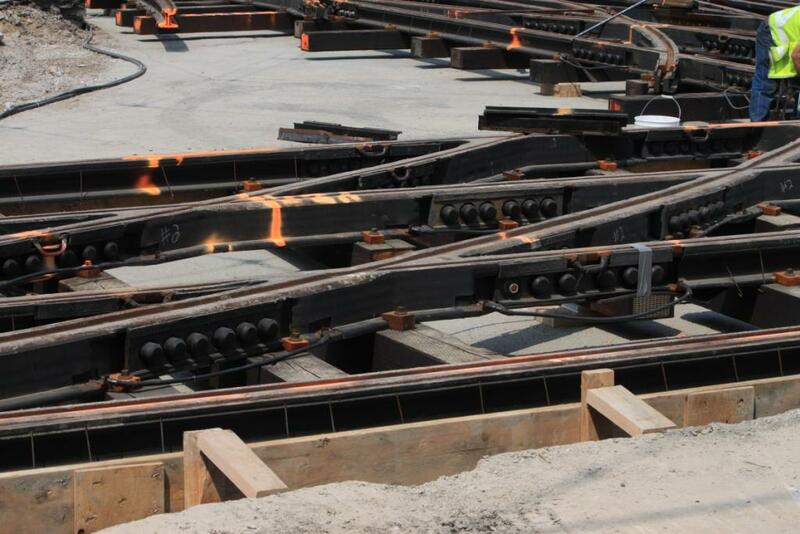 This track is extremely noisy because it was not built with mechanical isolation of the rail from the track slab. The fact that the TTC is now working through the “non-revenue” trackage shows how they have more or less caught up with the near-disaster caused by late 1980s track construction techniques that guaranteed a very short track lifespan. Church was done last year, and Adelaide is planned once various construction sites get out of the way. York, Wellington and part of Richmond are also outstanding. 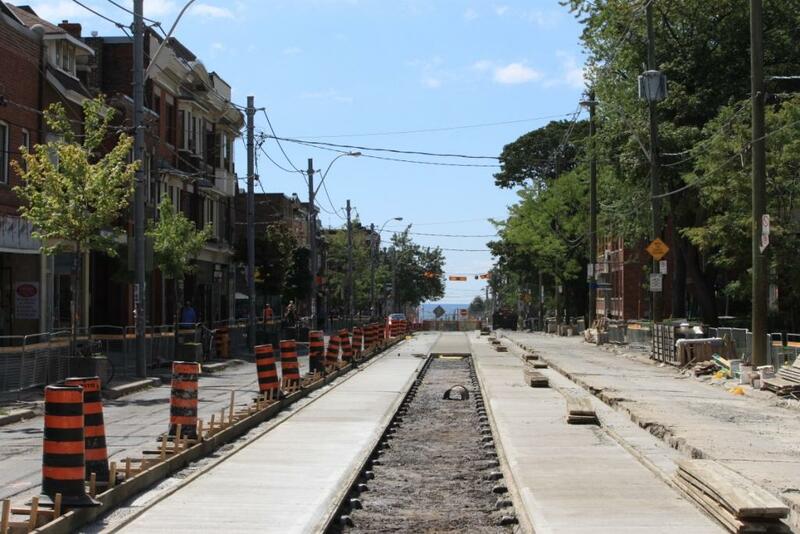 Updated:The track on Roncesvalles was previously rebuilt from Queen to Boustead in 1968, and again in 1985/86. 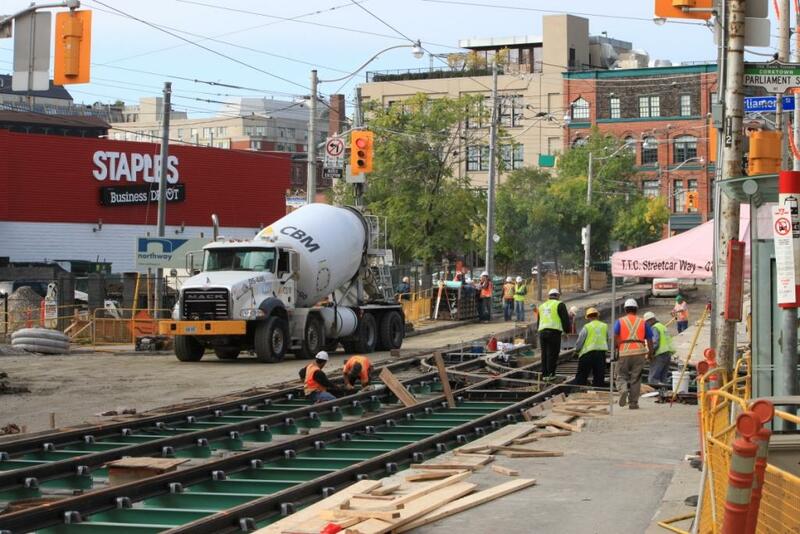 I wonder how the TTC is going to handle track rebuilds on the TC lines. How do we justify shutting down light rail lines for months at a time and replacing them with buses, and at the same time say that buses can’t handle the projected growth on these lines? Should we not encase the tracks in concrete and build something similar to the Queensway? I have wondered that myself. The design is to have cross-overs every 2-3 km, but I cannot say if these will just be trailing point crossovers for turn-backs only (common in Melbourne) or whether they will be both leading and trailing (used in Cleveland, St. Louis, and Sydney to name a few) to make left-hand running easier over parts of the line. This can greatly reduce disruptions during major track work by allowing service to continue, albeit at a more restricted minimum headway. 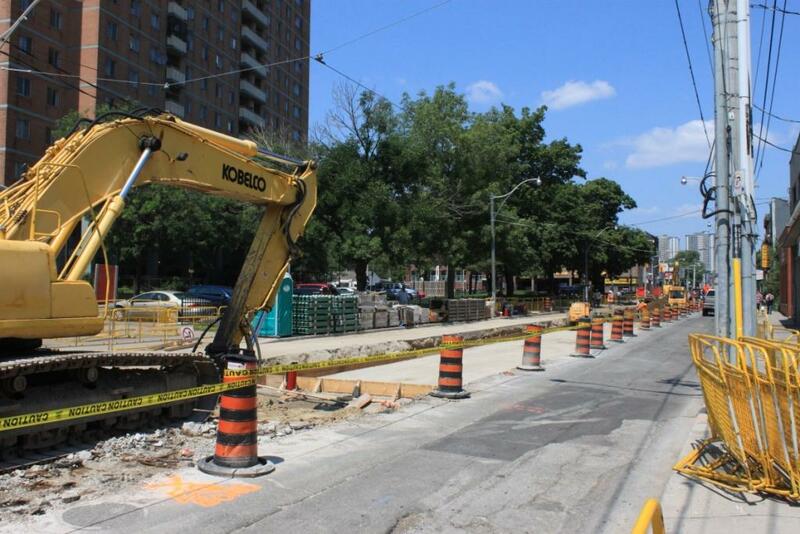 Supplementing service with buses is easier if the LRT continues to operate at a reduced headway through the construction zone. Steve: There is also the question of how the roadbed is built. If this is done in a way that allows quick excavation down to the layer where the tracks are bolted to the steel ties, then the top layer can be stripped off and service can continue to run. Changing out the track would be like a subway replacement, done quickly and overnight. The only real issue is the time needed for the fresh concrete to cure, although the TTC has been doing stop rail replacements on Broadview (which uses the new design) over weekends. It will be the stops that wear out first, and we will get a sense of how the TTC will handle this. As for crossovers, I believe that the lines will be set up for bidirectional operation on either track. 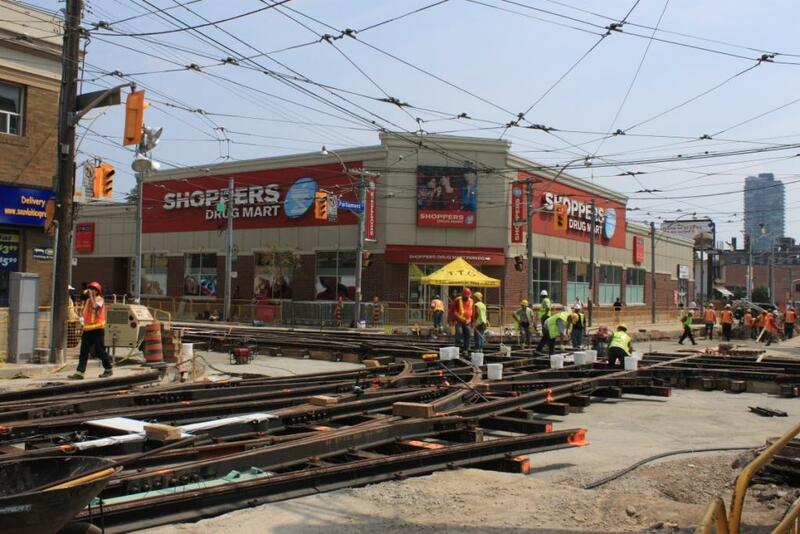 Is the TTC installing any track switching systems that don’t require stop-and-proceed? I’ve noticed that on the 510, some operators stop every time a truck bogie crosses the switch (so streetcars stop 3 times at intersections: once due to lack of transit priority, again after the first truck bogie crosses the switch, again for the station and passengers on the other side). Will this be an issue with the new Streetcars, since we’ll have 3 different car lengths? Steve: This is a big problem thanks to the TTC’s penchant for “safety first” rather than actually fixing the problem and replacing the bad electronics in systems that were installed to deal with the ALRVs. There is a capital program to upgrade, but who knows how long it will take to undo the mandatory stop at every switch. Imagine if the subway operated like this! Vancouver did some bi-directional running while they took one track out of service. They scheduled 2 trains to go through one close behind the other one way, then 2 trains in the opposite way. This way they were able to maintain the schedule on the rest of the system. Obviously this was not a frequent service. Shouldn’t a process like track repairs be pretty much never ending, if you need to replace track every 25 years or so, then you want it to take 25 years to get through all the trackage, so that the specialized crews that do the track repairs, do the last piece of track, then start over at the beginning. In theory though you want the modern design where repairs are essentially taking off the top layer, unbolting a piece of track, laying a new rail, welding it in place, and then laying a new top layer. Steve: Once we get to the end of rebuilding the last of the really bad track, the volume of annual work should drop. What happened over the past decade was that two generations of track wore out at the same time. One was the track that had reached its natural useful life of about 25 years, and one was the track that fell apart in 15 years or less thanks to bad construction. In almost every way I can think of, the TTC holds the subway system up to a much higher standard, whereas they don’t see the streetcar system as being as important. How can the operators see how the switches are positioned at night, in the rain, when there’s snow? Yesterday afternoon just after 6PM anyone on a westbound King or Queen car spent at least ten minutes crawling from Lansdowne to Roncesvalles. While the light timing at Roncevalles creates a natural blockage, the fact that car parking is still allowed in the curb lane did not help at all. Just two vehicles (legally) parked a short distance east of Roncevalles slowed all the cars and streetcars and King shuttle to almost a standstill. It’s a sign of the lack of priority and cooperation that parking is still allowed, when Queen is overloaded by traffic due to both King Street construction and cars trying to escape the Jameson bottleneck on the Gardiner. 2) The city should think of these measures before projects that make a mess of things are undertaken. From what I know of stores along that stretch of Queen, steet parking is not a big requirement for them to stay in business. Anyway, with all traffic at a standstill, it’s faster for their customers to walk, anyway. I have a grandstand view of the King/Church intersection, and of the many Queen Street Cars that continue to be diverted due to the trackwork at Queen and Parliament. The trolley pole of better than one in three cars turning from southbound Church to eastbound King come off the overead wire. Specifically the pole follows the westbound wire instead and evenually comes off. There have been all manner of maintenance crews there trying to fix it, even to the extent of installing a new switch (I am not sure if that is correct terminology since there are no movng parts), but to no avail. Is there something fundamentally wrong with this trolley pole system? Can it not be made to work? Or is it a maintenance issue. Come the new longer streetcars the driver will have a longer walk to the back to re-engage it. Steve: This may be a design issue with the location of the frog combined with the fact that most traffic turns south-to-west and wears the frog into this turn. A new frog should have fixed that implying that something is awry in the position. For the new cars, the shoes will be longer, and they will have their own issues at intersections, I am sure. Pantographs eventually, but I am not holding my breath. MarkE is quite right about the ‘pole problems” at King and Church but another problem is that the track switches need to be operated manually. When there is a major diversion the TTC has a ‘switchman” there to do this but at other times the drivers have to do it. As this junction was rebuilt in 2003 or 2004 it seems ‘unfortunate’ that the automatic feature does not work – though I have seen many TTC trucks looking as though they are trying to fix it. Steve: Only the left turn, west-to-south, is electrified. The TTC spends a fortune on pointmen for diversions, although electric switches are finally beginning to appear at intersections. Eventually, the need for pointmen should disappear, but it will take a while. 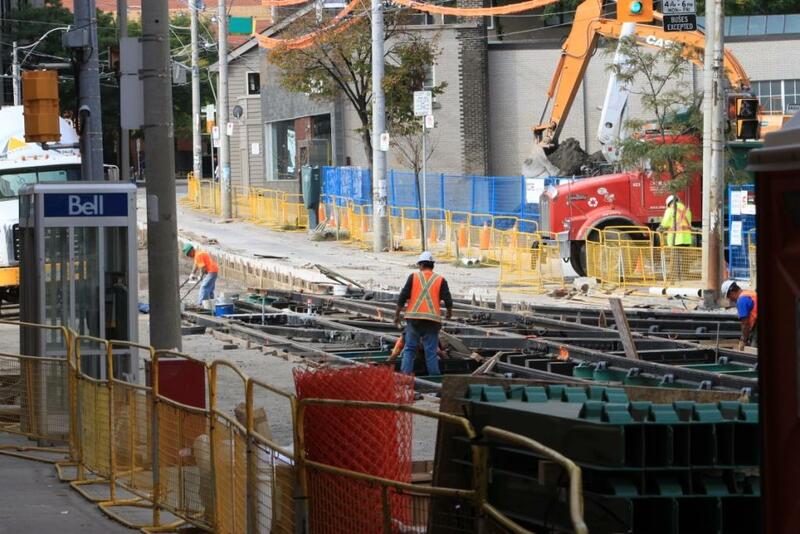 Given that I usually cycle Shuter eastbound on my way home, I’ve seen the progress of the track work on Parliament. It does seem it recent years there has been quite a bit of track work, though I suspect much of it was overdue. While that statement is a classic case of “comparing apples to oranges”, it could still sway many further to the notion that subways are the only way (the above could even be used to argue all rail transit, including GO, should be underground). 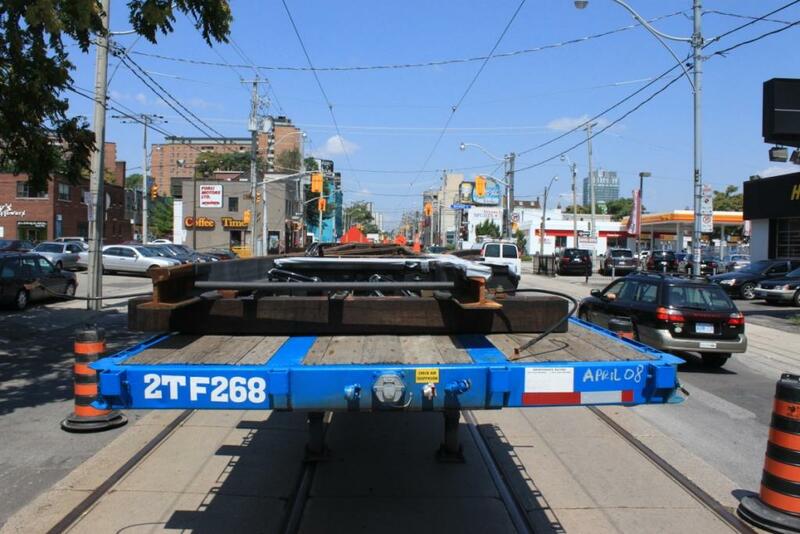 As for trolley pole vs pantograph, I would think that upgrade of the wire overhead to be compatible with pantograph would something the TTC should begin, especially as delivery of the new low-floor streetcars are still a few years away. I was in SF when they converted from PCCs to the Boeing Vertol LRTs and did extensive rebuild of the overhead. The initial test cars were fitted with trolleypoles but the overhead was pantograph-ready once the rolled out the new fleet. Steve: Sarah Thompson is far off the mark on several parts of her statement. First off, while the TTC has been doing a lot of trackwork in the past decade or so, the sheer volume of work is to make up for the shoddy construction used up to about 1993 which lasted only from 10-15 years. In effect, two generations of track had to be redone at the same time. The new construction is intended to be much more long-lasting, both for the base slab (which does note even exist for much of what has been excavated) and for the robustness of the top structure. As for subways, the TTC replaces track in the subway quite regularly, but of course we don’t see this happening except when there are major works such as the St. George crossover that cause weekend-long shutdowns. The subway tunnels do not last 100 years without repair as we have seen from many projects to repair water penetration and damage to finishes, not to mention the big project to repair the North Yonge tunnel where the tunnel liners have gone out-of-round through a combination of a weakness in design and the pressure of the earth above. Subway cars have a lifespan of about 30 years, the same as streetcars. As for the overhead, TTC is slowly moving to pantograph-friendly overhead, and the three prototype LRVs to be delivered next year will have both a trolley pole and pantograph to allow testing. 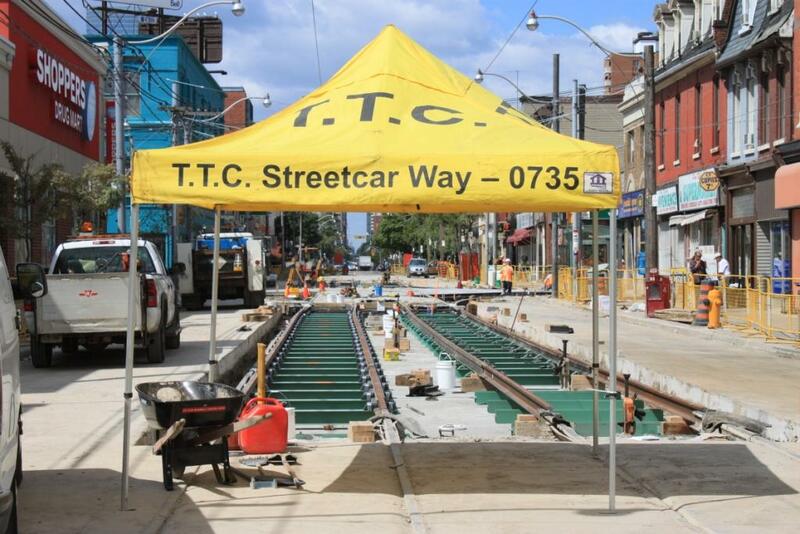 Too bad that the TTC has no rail grinders for streetcar tracks. There are lots of noisy sections of track, for instance the Lake Shore Blvd curve just east of Royal York. It’s nice that the base will last a long time, but how long will residents put up with howling, chattering wheels? Especially in the middle of the night — the faster the streetcars are running, the louder the noise, and at 4 AM there are no covering sounds. Going back to your updated comment: “This is an example of a lack of attention to details in the management of construction diversions that makes the effect worse than might otherwise occur.” The same happens with mis-set traffic lights all over the city, either not tripping an extended green for transit, or tripping it in the wrong direction. For example, if a Bathurst car is sitting at Richmond, Richmond gets an extended green. Figure out the sense in that! The TTC should be out there ensuring that its buses and streetcars aren’t stuck in traffic. I’m not even talking about true transit priority signalling, I’m talking about faulty signal detection or logic, or construction backups like the one cited above, that could be recognized and solved very easily. Maybe the project managers are overworked. Or maybe (shades of CIS) they think they can project manage out of their office cubicle, and couldn’t possibly need to visit the site in person. Steve: Places where the traffic lights impede transit stick out like a sore thumb in distance-time graphs of transit movements now that streetcars (and some buses) have GPS. This sort of analysis should be child’s play. Of course, the TTC still owes us a report re transit priority on Spadina Harbourfront from 2005. I am not holding my breath. Ed Says: The same happens with mis-set traffic lights all over the city, either not tripping an extended green for transit, or tripping it in the wrong direction. For example, if a Bathurst car is sitting at Richmond, Richmond gets an extended green. Figure out the sense in that! Are you sure that’s not due to a Queen car? The Bathurst & Richmond and Queen & Bathurst Intersections are setup for the exact same green times, they cycle identically (maybe half a second apart) because they are so close together. 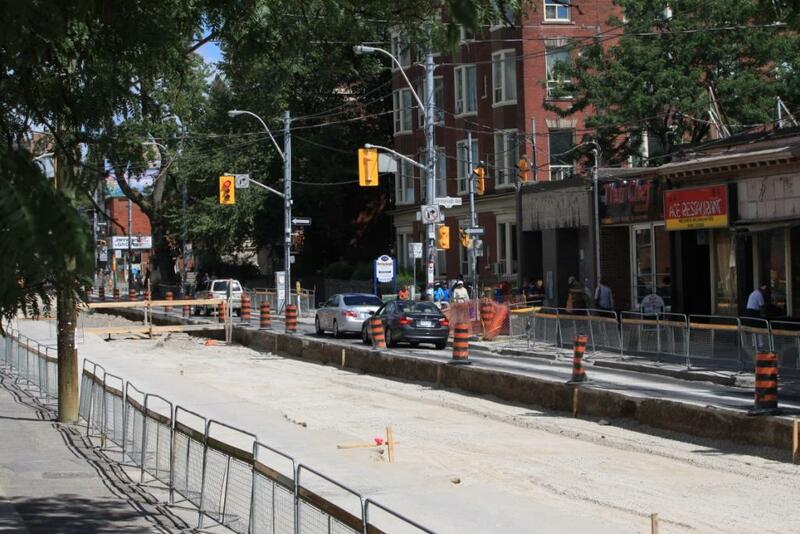 If a Queen car trips transit priority and gets Queen an extra long green, Richmond St will as well. Not to say there aren’t many other intersections where priority hurts more than it helps. Construction has started on Coxwell Loop replacement as well; seems they are tearing up track on Coxwell when I went past. 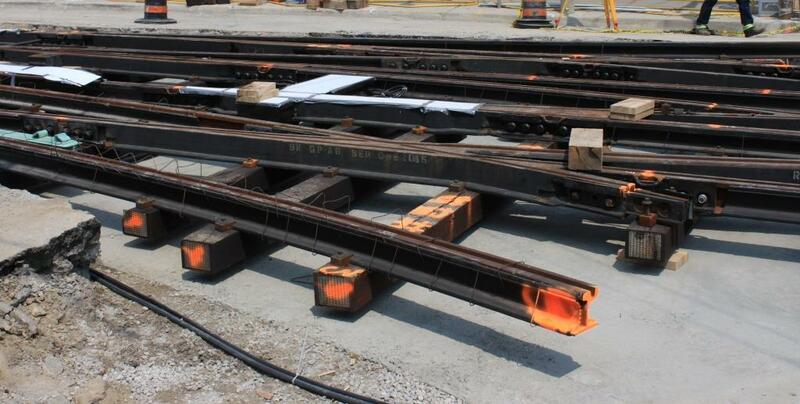 Steve: Yes, that project has reached the point where the special work and track leading to the loop have been removed, and the new track panels are sitting on trailers further up Coxwell awaiting installation. The loop itself will be done in the next stage. Meanwhile, the 22 Coxwell bus takes a small sightseeing tour via Queen, Eastern, Woodward, Queen, Greenwood and Dundas to route. 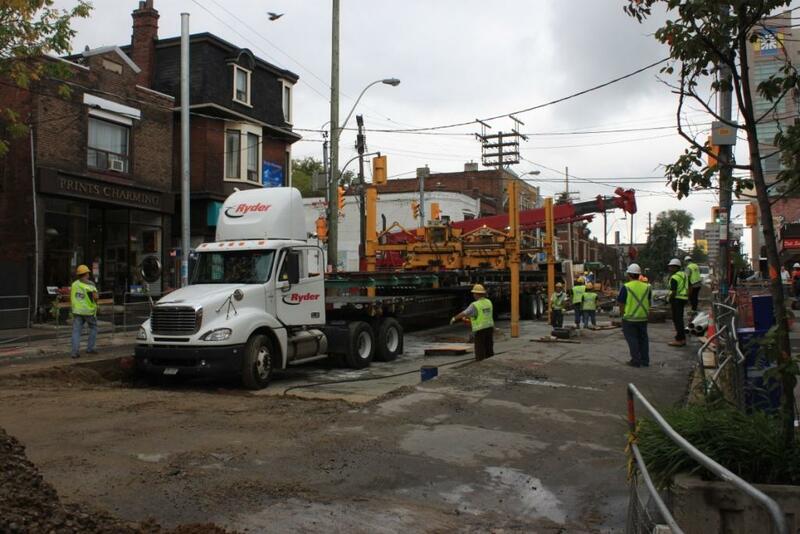 I am not documenting small projects like Coxwell-Queen Loop in detail here because the intention of this article was to track two major projects in the hope that they would be done briskly, well and on time. So far, Ronces and Parliament have both proceeded as expected. 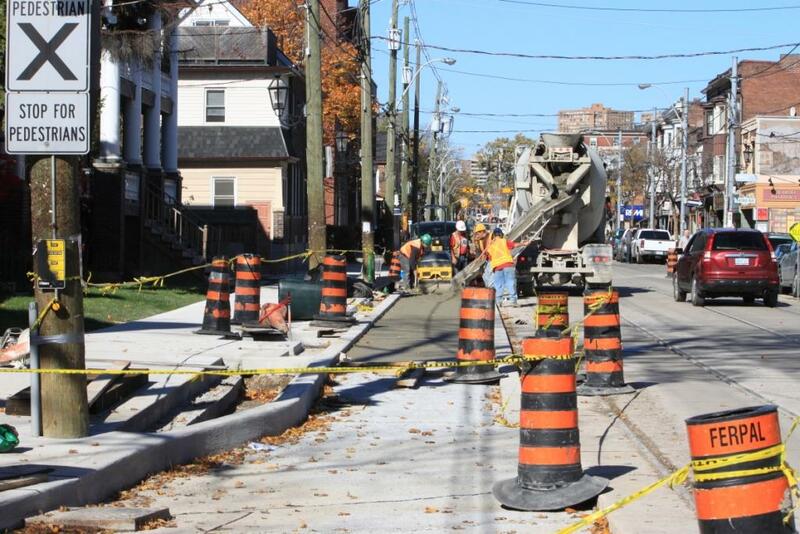 Of course, the mayoral candidates who paint St. Clair as “typical” are ignoring these projects because they are being done properly and, in the case of Roncesvalles, with extensive local input and support. 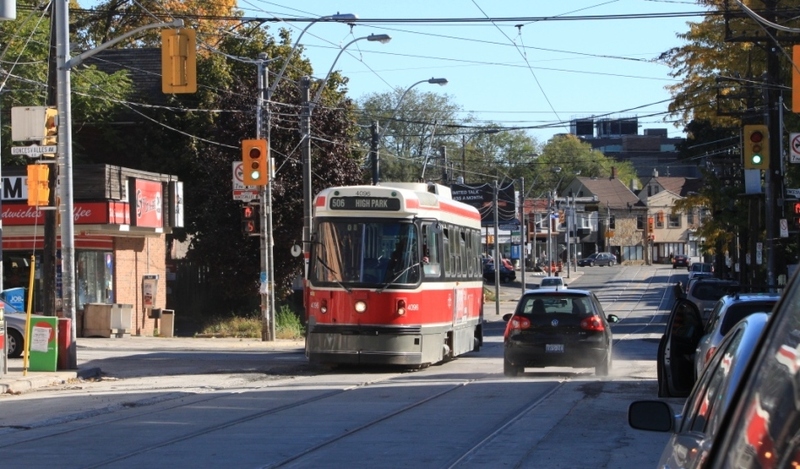 I just noticed on the TTC website, that streetcars are coming back to King between Roncey and Shaw starting next week. Are they way behind on the track replacement – or am I just going insane from the watermain work outside my house? 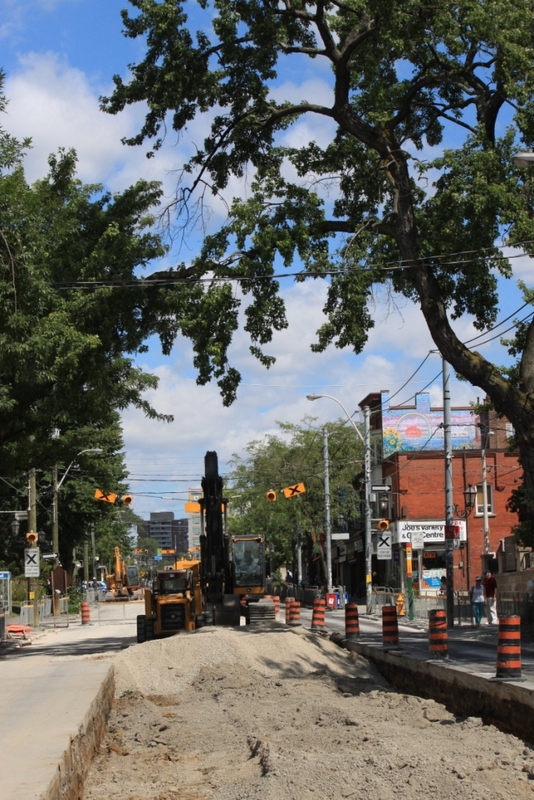 Regardless of what happens – for the month that the streetcars apparently come back – hopefully it does something to ease traffic… Parkdale is a mess right now. I see the Queensway work will now, in a way, create the Steve-inspired 507, albeit a bus and not a streetcar. 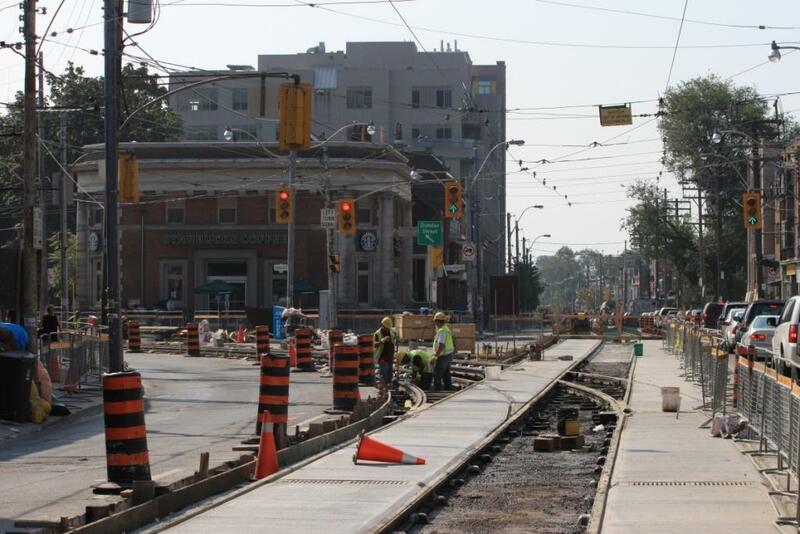 Steve: I suspect that they are putting the streetcars back on King for a time because there are only so many track crews and spare buses to go around. 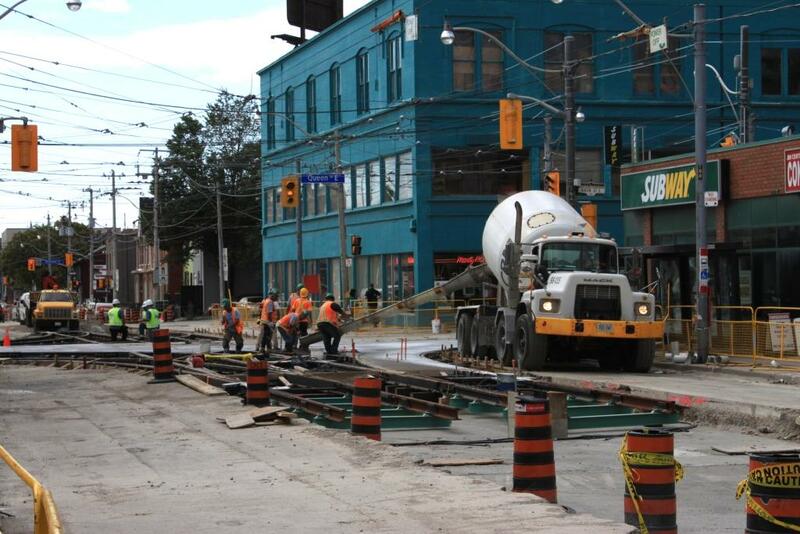 The trackwork on Ronces seems to be going quickly and more or less on schedule, and I had thought that they would move to King Street immediately afterward. 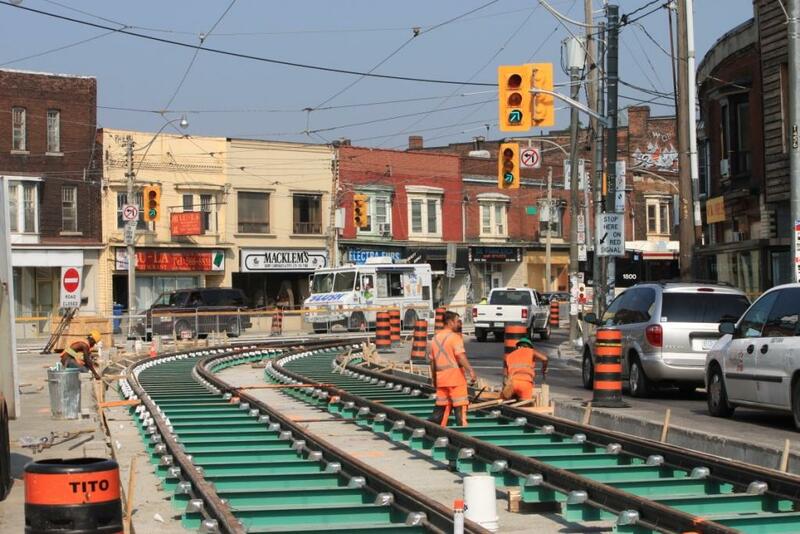 However, there is the small matter of finishing Roncesvalles (curb lanes, sidewalks, overhead) to get the streetcars back up to Dundas West. Possibly the work on King itself has been deferred to 2011. I will check into this. Nice photos of the areas and how new track is installed from its foundation up. Gee. TTC may need your photo archives some day of things they had not kept in their files. Steve: I am deliberately documenting this construction in detail to show those who complain about the work that (a) it can be done efficiently and (b) there is a reason that the first build to the new standard takes so long. 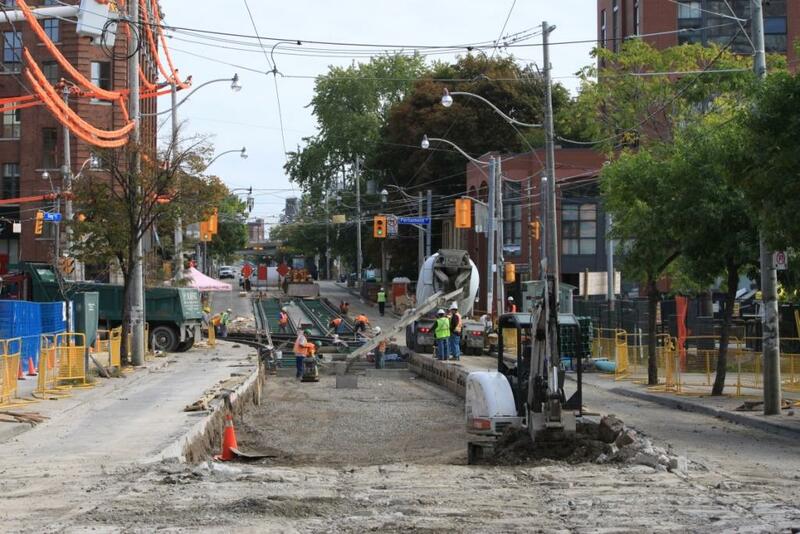 I agree that the Parliament rebuild of the TTC track is moving along very well and should be finished in the next few weeks, at least from King to Dundas (the short section from Dundas to Gerrard is still untouched.) Of course the City then needs to fix the sidewalks and roadway but they seem to be working on the west side of the street already so this too may all be done before the supposed completion date of “December.” Of course there are still some silly problems with lack of coordination; they just poured new sidewalks at Queen and Parliament without removing old and ‘de-wired’ poles and I expect the same to occur at the King/Parliament junction – unless someone from the TTC reads this! There seems to always be a traffic jam of automobiles trying to turn left from King Street West to The Queensway. (Westbound Queen at that intersection is another story.) In my own imagination, I would have shifted the tracks more southwest to allow a left turn lane for the automobiles, putting the tracks in their own right-of-way, if possible. Or at least a left-turn hook turn, keeping the tracks clear. See this video at to see what I mean. The Parliament Construction page remains vague about the King/Parliament closure dates while, as you note, the Route Diversion page gives the full story. It is indicative of the TTC’s lack of communication skills that the TTC Community Liaison Representative in charge of the Parliament Street work (and others) has no listed email while the City engineerr has. The Customer Service Panel recommended that all TTC staff get email addresses – it would seem that their “Community Liaison Representatives” should be top of the list and that these email addresses should be public! 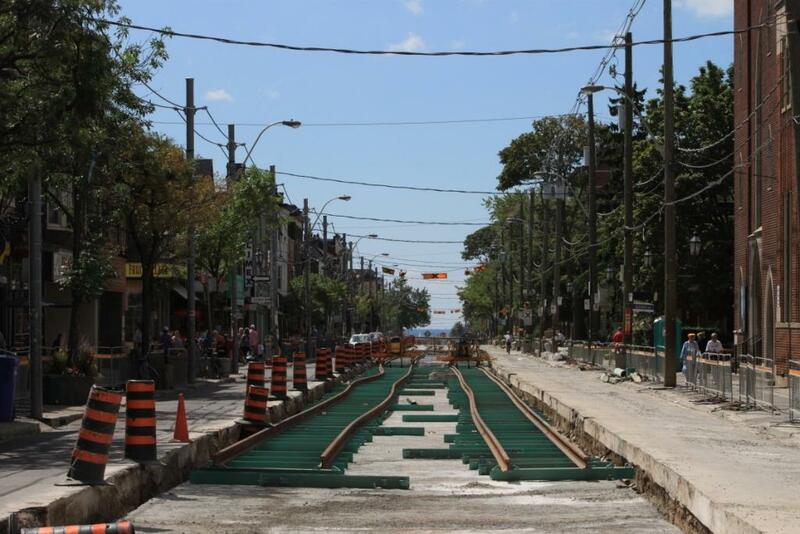 There may be a problem with the new track on Roncesvalles. In three spots that I know of the track is distinctly crooked, the crooked track runs for about 10 meters before it is corrected. There does not appear to be any reason for the aberration. It just looks like a mistake. I have pictures I can send if you wish. Steve: These locations may correspond to stops where the car “pulls in” to the extended sidewalk (which has not been built yet). It’s a rather odd way to do things, I must admit. What does the rail handling equipment do that can’t be done with a regular crane? It seems like sometimes invented a circular rotating device. Steve: A regular crane cannot pick up the track panel given its length and weight, nor manoevre it into position. 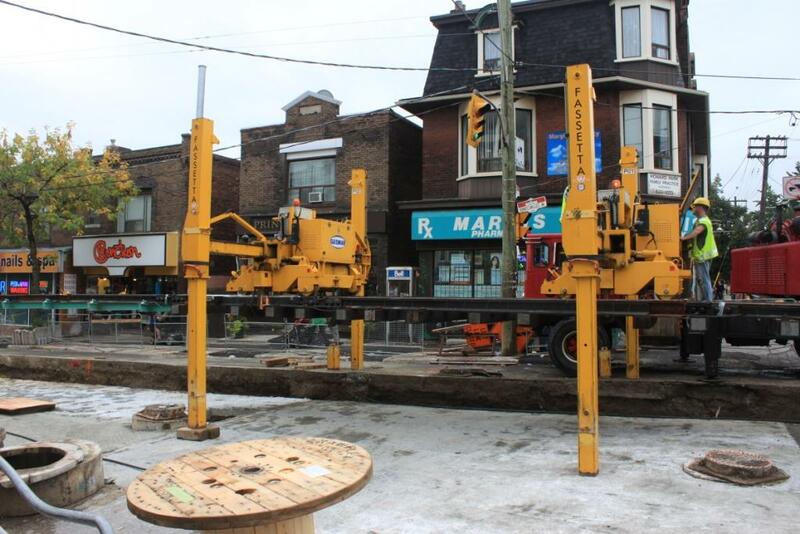 Lest this appear to be some TTC technology boondoggle, it is a standard piece of rail maintenance equipment elsewhere in the world, and saves a lot of time/labour. Because the track handling cranes can “walk” over uneven terrain, they can be used in locations where it would be very difficult if not impossible to use a crane. This is a comment that could go either go with the lakeshore article or this one. The bus substitution on Lake Shore runs to Dundas West station on weekends. Today, I saw two westbound 501 buses nose-to-tail in the curb lane, with a third 501 right beside them in the left lane. This somehow reminded me of typical rush hours on 39 Finch East. The lesson here is that rerouting Long Branch cars does nothing without route supervision. The TTC is pretty generous by laying on way more buses on the weekend than we’d get streetcars, which is okay because none of them is going to be packed, so the frequency increases without exceeding the capacity of any one vehicle.